Knowing how to sharpen a knife can be a useful skill in many situations, and something everyone should know how to do. It’s a process you can’t master overnight, but there are tricks and tips to follow to get the best results in the shortest amount of time. Learning how to do this is one big step in becoming a survivalist. I’ll guide you through how to sharpen a knife, but first, let’s go over some of the common mistakes people make, to help prevent you from making the same ones. There are four reasons why people fail at this. Most often, missteps occur because we’re impatient. Here’s what you need to avoid from the very beginning. 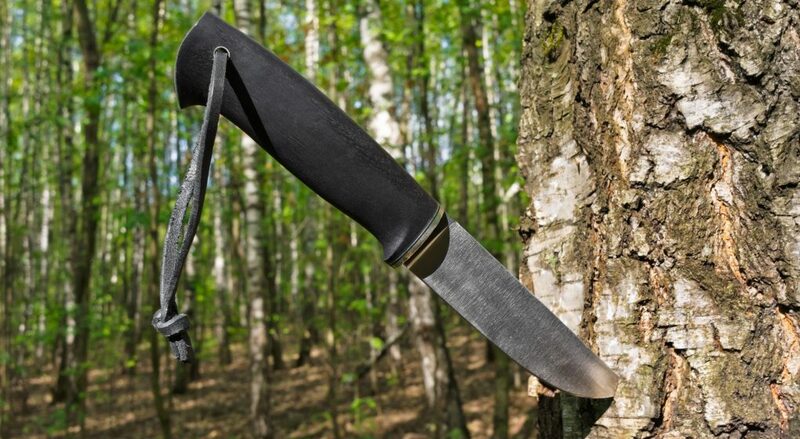 Don’t pick out a very dull knife as the first one to practice on. This makes the learning process extremely difficult for various reasons. It’s almost certain that you won’t see any real progress at the very beginning. For this reason, most people think they’re doing something wrong and are quick to change their technique. This is a critical error. Some people start on too fine of a grit on their sharpening stone. Or, another mistake is that some transition from a coarse to a finer grit too soon. If you have a wrong sharpening angle, you’ll fail. Too steep of an angle causes a whole different thing to happen, and it’s not what you’re looking for. Now that you know what to pay attention to and avoid, we can now move onto sharpening process itself. The most important thing to talk about is the angle of contact between the knife and the sharpening surface. These angles go from ten to thirty degrees, or even more. Most people, including myself, prefer fifteen to twenty degrees on both sides. This gives you the total angle of thirty to sixty degrees. If you’re a beginner, it won’t be as easy to determine the angle right off the bat. However, there are a few tricks to help you with that. As time goes on, you’ll get better at that, and you’ll be able to evaluate the angle just by holding the knife. First, and the most common is the two-penny trick. All you have to do is place two pennies under the blade to get somewhere near a 15 to 20-degree angle. It’s important to remember that you shouldn’t sharpen the knife while the pennies are still under it. The coins are there to help determine the angle, and then you should remove them. Keep the blade at that angle as you’re sharpening. Of course, you can place them back if you need to check the angle at times. There’s another way to determine the angle, and it’s by using a small and square paper that you’d fold in half diagonally. By doing that, you get a 45-degree angle, and by folding it again the same way, you get a 22.5-degree angle. Now all you have to do is place the edge of the blade over the paper and adjust it. Just like the penny-trick, the paper is there to help you get the right angle. You want to remember the angle so the next time you can get it without any tricks. After you get the angle you want, it’s time to start sharpening. When it comes to sharpening, there are also a few techniques and ways to do it. Some people go in circles while some go back and forth. However, most people consider back and forth motions to be more efficient and fast. Just keep going until you establish an edge. Take your time and check the angle as many times as you feel necessary. It’s important to go slow and keep an eye on that angle as it’s the most crucial thing to pay attention to. I suggest you go only five to ten motions and then stop to check your progress. Check where you’re removing steel and if it needs any corrections. By checking the process frequently, you can properly adjust before something goes wrong. After about ten strokes, you can switch sides to make sure your edge is symmetrical. Always make the same amount of strokes on each side. In conclusion, this is roughly how you can sharpen your knife if you’re a beginner looking to gain some experience. With practice, patience, and time, you’ll quickly learn how to do it without any pennies or folded papers, but by easily holding and observing the knife.